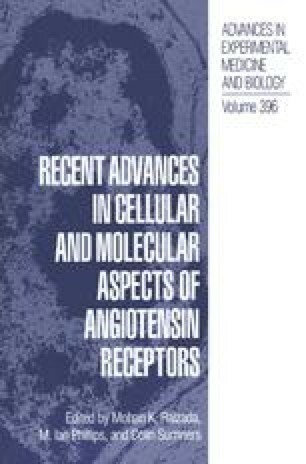 Peptidic angiotensin II (Ang) antagonists have been mostly reported to behave in a more or less competitive fashion. Thus, reinforcing the view of competitive analogues being compounds which can reversibly bind without producing any biological response to the receptor as well as competing with an agonist (e.g. Ang or other peptidic agonists) for the same site. Recently, a new concept was introduced that changes the classical view of agonist-antagonist action. This concept presents the receptor as a dynamic structure capable of undergoing a conformational change between a biologically active and an inactive form. A bound ligand may shift the equilibrium to either side, according to its pharmacological character as an agonist or an antagonist: An antagonist favoring the inactive form of the receptor represents what is called an “inverse agonist”. All peptidic Ang analogues bind to the same locus on the AT1 receptor but non-peptidic AT1 binding compounds (e.g. L-158,809 and DuP 753) seem to bind to different loci. Furthermore, it has also been shown that non-peptidic Ang antagonists do not possess the ability to recognize Ang receptors from amphibian or avian origins. In the present contribution, we attempt to fathom the molecular parameters that bring the transition from an agonistic to an antagonistic behaviour in order to select the compounds that display most profoundly these antagonistic features. We believe to possess the necessary tools (enlarged but planar aromatic side-chains in position 8) in order to explore the concept of inverse agonism on the mammalian AT1 receptor.